Natural Parks, untouched nature, charming white villages ahead a few miles from the coast. As for instance the Axarquia, a little known gem of the Costa del Sol. Covering an area of two Natural Parks and the highest peak of the province, in full tourist boom the Axarquia, dotted with Moorish white villages, has retained its charm and history, perhaps because of its particular and beautiful terrain. In the 31 municipalities that make up the region, visitors can find great natural areas of mountain ranges, mountains, hills, gorges, olive trees, almond trees and vines, vegetables and tropical fruit, lemon and orange trees, beautiful beaches and of course a delicious local cuisine. The coast of the Axarquia begins with the end of the term of Malaga city, in the district of El Palo and stretches until Maro where it meets the tropical coast of Granada. Great natural spaces are the Natural Park of the Sierras Tejeda, Alhama and Almijara where there is situated the highest peak in the province, the Maroma with 2066 m altitude; and the Cliffs of Maro-Cerro Gordo. Probably the best known town of the Axarquia is Nerja. In total, the Axarquia is composed of 31 municipalities: Alcaucin, Alfarnate, Alfarnatejo, Algarrobo, Almachar, Archez, Arenas, Benamargosa, Benamocarra, El Borge, Canillas de Aceituno, Canillas de Albaida, Colmenar, Comares, Competa, Cutar, Frigiliana, Iznate, La Viñuela, Macharaviaya, Moclinejo, Nerja, Periana, Rincon de la Victoria, Riogordo, Salares, Sayalonga, Sedella, Torrox, Totalan and Velez-Malaga. The region enjoys a subtropical climate that allows cultivating exotic species such as Mangos, Avocados or Custard Apple and which have led to local inventions such as the “Baticate” (Avocado Smoothie) in the village of Benamargosa. There is also an old tradition of raisins and sweet wines that made this area famous in the eighteenth century, when flourished the export of these products, and honey (in Colmenar). Finally, we cannot forget the delicacies from the sea. In fact, the famous grilled sardines are from Rincon de la Victoria and also the delicious Victorian anchovies. To enjoy all the richness of the region, have been created 5 thematic routes of tourist interest. This route takes us to the past days of Al-Andalus along the slopes of the highest mountain range in the province. Along 40 km we can discover the Muslim heritage in villages that still conserve the most outstanding examples of Moorish architecture in the area: Arenas, Archez, Salares, Sedella and Canillas de Aceituno. The coast of Axarquia has a subtropical climate and abundant crops of avocados and tropical fruits like Mango, Papaya or Custard Apple. Municipalities along this route are: Rincon de la Victoria, Macharaviaya, Velez-Malaga, Benamocarra, Iznate y Benamargosa. Along this route we can enjoy both the coast and inland, discovering the villages Algarrobo, Sayalonga, Competa, Canillas de Albaida, Torrox, Nerja and Frigiliana. 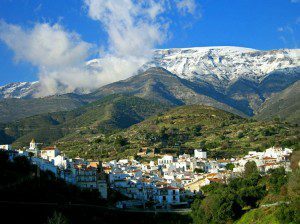 Notable villages are Competa for its wine, Sayalonga for their Loquat, Algarrobo for their cakes, Nerja for its famous caves or Frigiliana for its cane honey. On this route we can enjoy the spectacular beauty of the surrounding mountain ranges, the Viñuela reservoir, as well as an excellent cuisine: In the area is produced the “liquid gold”, olive oil of “verdial and hojiblanca” variety, one of the best in the world. Furthermore we can enjoy sausages, cold meat and honey in Colmenar; the famous peaches and goat cheese in Periana; Roman bread in Alcaucin, snails and olive oil donuts (Roscos de aceite) in Riogordo or Gazpacho in Alfarnatejo. The villages of this route are: Colmenar, Riogordo, Alfarnate, Alfarnatejo, Periana, Alcaucin and Viñuela. 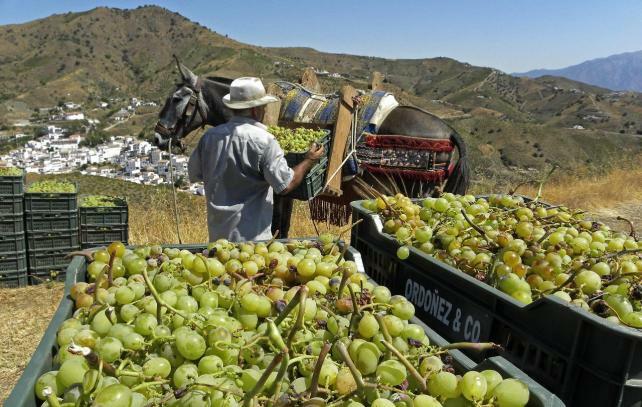 The Axarquia is known from Arab times for its delicious raisins which are considered the best in the world, and the famous Moscatel sweet wine. 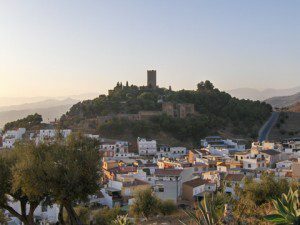 We can also enjoy wonderful panoramic views from Comares, the Balcony of Axarquia, along this route which includes the villages of Totalan, Comares, Cutar, El Borge, Almachar and Moclinejo. Which of the routes is your preferred one? 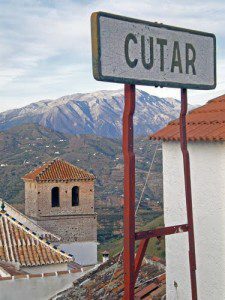 I am coming to Andalucia in March, and staying part in Nerja and part in Malaga. I will print off your blog about the Routes of the Axarquia as this is exactly the kind of individual tour I wish to do. 30 years ago, my Father would regularly visit Nerja and Almunicar and it is because of him, now passed, that I am coming to Spain again. I have been very unwell this past year, and hope to be revitalised by the warmth of the Andalucian people, climate, food and wine. I’m sure you will get well as soon as you land at Malaga airport. Nerja and Almuñecar are lovely places and the climate is superb. We hope you enjoy the Mediterranean life so much as we do!